As an entrepreneur, you’re going to be making important phone calls like this on a regular basis. Whether it’s a prospective customer, potential mentor or possible business partner, you have to give them a great impression. In this post, I’ll give you a script to make sure your nerves don’t get the best of you and breakdown the voicemail script so you know why each component is important. Practice saying this a few times right now while no one is listening. Think of it as kissing the back of your hand for practice. It’s going to be weird but it’s for your own good. It should last 30 seconds. The voicemail, that is. Address the person you’re trying to contact with enthusiasm. It’ll set the tone for the rest of the voicemail. What’s the first thing you do when you see that cute girl or handsome guy? You say hello and put a big smile on your face. When you introduce yourself and who you are, make sure you use your full name and give them a tiny bit of relevant information about yourself. If that girl or guy has never met you before, the first thing they’ll want to know is who you are. After they know who you are, they’re going to want to know why you’re calling. Make sure this is succinct (one or two sentences). Also make sure you don’t give any private information because you don’t know who is going to listen to the message. When you’re leaving a voicemail, it’s best to get straight to the point. This politely lets them know that you would like to talk to them. It’s the call-to-action. When you leave your phone number, make sure you include your area code. Don’t assume that that fine young lady or man knows where you live. By this time they have a pen and paper handy. They might have already forgotten your name so you want to say it again. Then repeat your number slowly as though you’re sweet talkin’ your baby. This gives them time to write it down. What about caller ID? Some phones don’t have it and some people get multiple phone calls per day from random numbers. Don’t make them guess which number was yours. Wouldn’t it be a shame if you put all this effort into contacting your crush but you didn’t properly give them a way to call you back? That would drive both of you crazy. 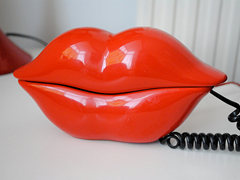 End the voicemail by letting them know that you expect to get a phone call. As an act of kindness, tell them to have a great day. Maybe it’s the first time they heard it all day. Let me know if you have any information that should be included in a voicemail in the comments area below. If you like this article, consider sharing it with your crush/business partner. They might get the hint ;). P.S. Let’s say you own a web development company and you find someone who doesn’t have a website but needs one. If you leave a voicemail that says, “I’d like to talk about your website.”, that person is going to call you back out of confusion. This also raises their awareness that they don’t have a website and might need one. Perfect leeway into your services!